« Who Knows About Amazon Echo And Smarthubs? (The Hill) The Federal Communications Commission (FCC) is moving forward with a plan to scrap net neutrality rules, defying a massive outcry from activists, Democrats and consumers. Polls on the topic vary, but a recent Morning Consult/Politico survey found that 52 percent of voters support the rules that are in place, including 53 percent of Republicans and 55 percent of Democrats. Overall disapproval of the rules sits at 18 percent. Pai and the other FCC Republicans defend ending the rules, saying there is little danger that broadband providers will slow down or censor internet content if they aren’t in place. The regulations are too onerous, they say, and hurt the industry’s ability to innovate and tailor their services to consumers. In fact, with the NN rules in place, there is a lot of censorship going on right now. I do not use it, but someone was explaining how all sorts of apps and providers disappear all the time for those who use Kodi to stream movies, tv show, and live content. They said that around a week or two ago, when they looked to watch a show, where they were usually 20+ streams, there are now less than 10, and they’re lucky if just one works. It’s understandable, because the stuff is pirated, but, ISPs are shutting down the streams. 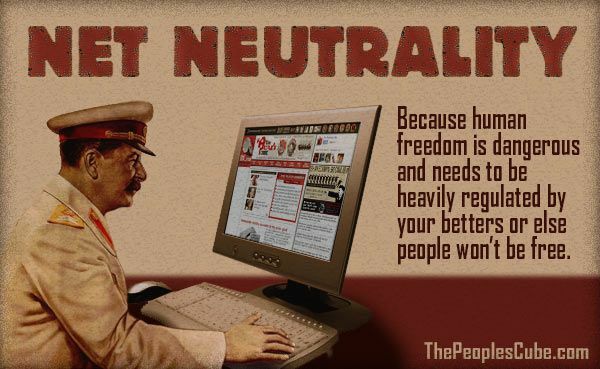 It’s a bad idea to treat the Internet like it’s the phone company using 1930’s rules. Democrats, major internet firms and tech startups see things very differently. They say the net neutrality rules are essential for preserving an open internet. Without them, they warn, web companies will no longer compete on a level playing field. When Democrats start talking about freedom, run, because their version of freedom always involves massive amounts of government. This entry was written by William Teach and posted on at 6:37 am and filed under Web/Tech. Bookmark the permalink. Follow any comments here with the RSS feed for this post. Pirate's Cove is powered by Pure Neocon Pirate Evil. Oh, and WordPress 5.1.1. Delivered to you in 0.810 seconds.